Daily Harvest is a subscription based smoothie service that delivers delicious, ready-to-blend smoothies to your door. A healthy hack for smoothie lovers who want to try the latest superfood-packed smoothies, without the shopping, chopping and waste. We put the fresh, whole food ingredients at the center of their branding, and created an equally fresh and playful brand voice that shaped the website, packaging, smoothie profiles, social, and even made its way on to magnets and t-shirt swag that customers went nuts for, with lines like "Namaste Away From Cupcakes" and "My Rap Name Is Smooth E". 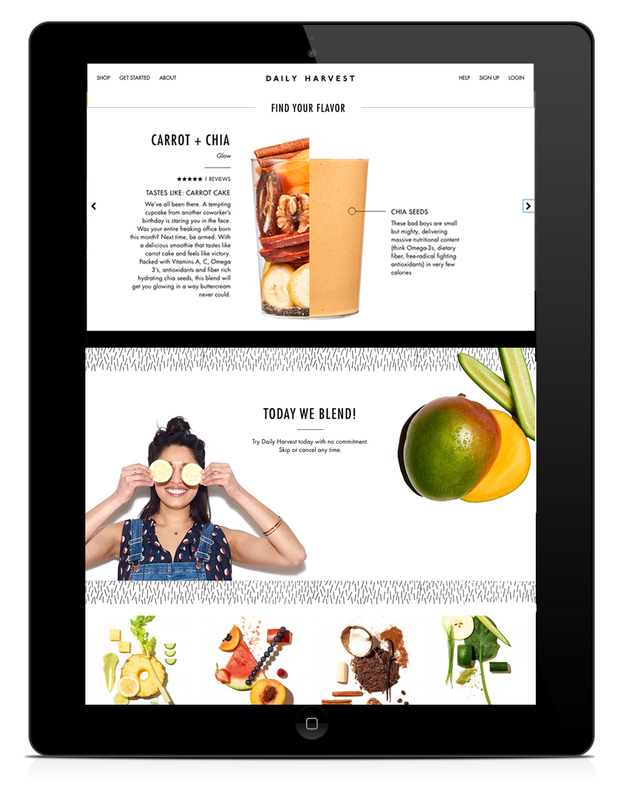 To help customers figure out their "smoothie style", we created an interactive quiz that makes flavor selection fun and easy.